This specimen is from a 36 y/o male who presented with a mass involving his right upper thigh and gluteal region. The specimen measured 20 x 15 x 15 cm and had yellow-tan, soft gelatinous nodules alternating with firm grayish-white areas. Foci of hemorrhage were also present. 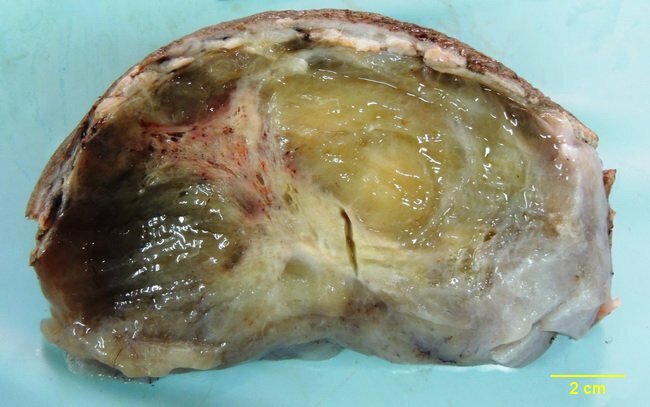 Histology showed myxoid liposarcoma. Case courtesy of: Dr. Sanjay D. Deshmukh, Professor of Pathology, Smt. Kashibai Navale Medical College, Pune, India. Used with permission.